There was a WUWT guest post recently by Paul Homewood on GHCN and GISS adjustments, and their effect on Iceland. It was somewhat along the lines of an earlier Eschenbach post on Darwin. When are the legal people going to be brought into this? Someone should go to jail if this is tampering as it appears. No, history was not rewritten. What the folks there don't seem to want to acknowledge is that GHCN circulates two files, described here. The file everyone there wants to focus on is the adjusted file (QCA). This, as explained, has been homogenized. This is a preparatory step for its use in compiling a global index. It tries to put all stations on the same basis, and also adjust them, if necessary, to be representative of the region. It is not an attempt to modify the historical record. That record is contained on the other data file distributed - the unadjusted QCU file. This contains records as they were reported initially. It is generally free of any climatological adjustments. For the last 15 or so years, Met stations have submitted monthly CLIMAT forms. You can inspect these online. Data goes straight from these to the QCU file, and will not change unless the Met organisation submits an amended CLIMAT file. This is the history, and no-one is tampering with it. The adjusted file does change, as the name suggests it may. Recently, it has been modified to use an improved pairwise comparison homogenization algorithm due to Menne and Williams. It is now (as of Dec 15 2011) used by GISS instead of their own homogenization algorithm, which makes the QCA file much more significant. Update. I have a new post which looks at the GHCN adjustments more generally, with visualization. a) Were the Iceland Met Office aware that these adjustments are being made? No we were not aware of this. b) Has the Met Office been advised of the reasons for them? c) Does the Met Office accept that their own temperature data is in error, and that the corrections applied by GHCN are both valid and of the correct value? If so, why? The GHCN “corrections” are grossly in error in the case of Reykjavik but not quite as bad for the other stations. But we will have a better look. We do not accept these “corrections”. d) Does the Met Office intend to modify their own temperature records in line with GHCN? And the Met sent their own version of the Reykjavik data. But what is missing from this dialog is that GHCN was never altering their QCU record, and is not suggesting that the Iceland records should be changed. I'll show the QCU data for the period most complained of, post 1939. Units are .01°C. Unfortunately, the Dec numbers got lost in formatting. Despite all the invocation of the Iceland data, there is no electronically readable form supplied. You can compare the link above, though, and you will see that the GHCN QCU data is almost identical. There are changes of a fraction of a degree - the Iceland Met do say that they have also made some adjustments. Actually there are isolated differences. These seem to be sign differences, where GHCN has a negative sign. The sign may have disappeared in scanning the Iceland numbers. The story of the Reykjavik adjustments was taken up by Ole Humlun, with again the same disdain for the record contained in the GHCN QCU file and the purpose of the homogenization adjustment. 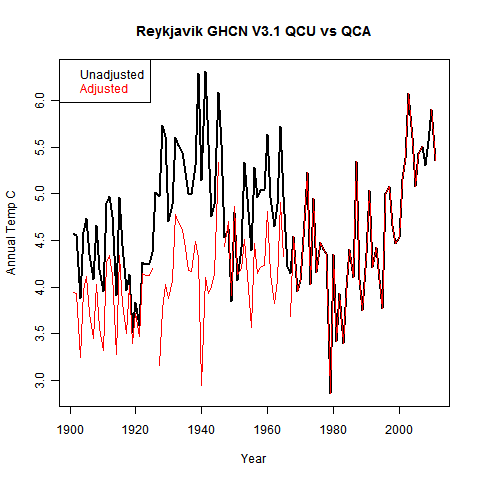 He refers to the Iceland data, and to Rimfrost, but does not mention the almost identical QCU. It is true that the adjustments have changed recently. V3.1 was released 4 November 2011. 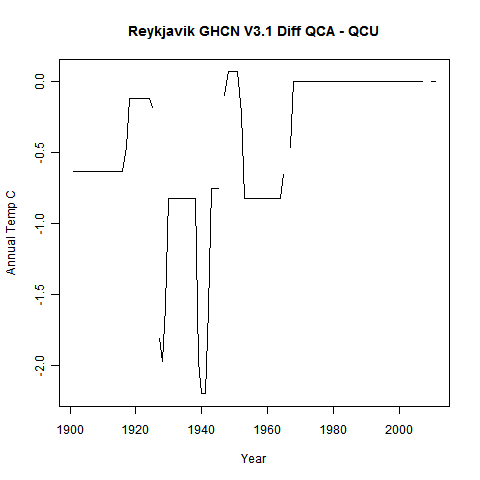 I have a QCA file from 14 July 2011, and this is, for Reykjavik, almost identical to the QCU file. I have a v2.mean file from Dec 2009, which is the V2 unadjusted file, and it is essentially identical to the current QCU file. In v2 style, it had duplicates. there were four for Reykjavik, but they had little overlap and where they did, were consistent. The unadjusted file has not changed, but the QCA file has. I also have an adjusted v2 file from Dec 2009. The adjustments are substantial, but less than the current ones. As you see, the adjustments are substantial. I have done a repeat of the GHCN analysis that we did for Darwin, with a histogram of the effect on trends. I will blog about this shortly. Current estimate is that this adjustment is in the top 10%. The dry adiabatic lapse rate (DALR) is in the news again. Willis Eschenbach has led a discussion primarily directed at a theoretical musing on whether gas under gravity but without heat input would have a lapse rate or be isothermal. where z is altitude, g gravity acceleration, and cp is the (constant pressure) specific heat of air. Any gas cools when it expands adiabatically (ie without exchanging heat with the environment). The rate at which dry air cools as it rises (and the pressure falls) is also the DALR. The air generally does have a lapse rate which is not quite as large as the DALR. This observed rate is called the environmental lapse rate. The difference is often attributed to the effect of water condensation, and there is reference to a moist adiabatic lapse rate. I think that is only part of the story, as I'll show. But my view of the role of the DALR, and the answer to Willis' query, is fairly simple. Air motions create a heat pump which move temperatures toward the DALR. If you could prevent all motion, conduction would move the temperature gradient to isothermal. But you can't; in practice the air needs heating to keep it from liquefying, and that will always create motion. In this post, I'll review the heat pump notions, and add an entropy viewpoint which will quantify some of the issues. The heat pump of moving air. When the lapse rate is below the dry adiabat (toward isothermal) it is referred to as convectively stable. Above the adiabat, it is unstable. At the adiabat, it is neutrally stable. At the adiabat, rising air cools by expansion, at exactly the rate at which the nearby air is becoming cooler (by lapse rate). And falling air warms. There is no buoyancy issue created. Moving air retains the same density as the environment. And no heat is transferred. But in the stable regime, falling air warms faster than the change in ambient. It becomes less dense, so there is a force opposing its rise. That is why the air is stable. This motion both takes kinetic energy from the air and moves heat downwards (contra your statement). It is a heat pump which works to maintain the lapse rate. Rising air does the same. It cools faster, and so rises against a buoyancy force. It takes KE from the air and moves “coolness upwards”, ie heat down. It pumps heat just as falling air does. That is why air in motion tends to the adiabat lapse rate. A heat pump requires energy. Where from? The atmosphere is famously a heat engine, driven by temperature differences, most notably from equator to pole, but also innumerable local differences, eg land/sea. This provides the kinetic energy that maintains the lapse rate, and it is hard to imagine any planetary atmosphere where the energy would not be available. The effectiveness of the heat pump tapers as the adiabat lapse rate is approached. Beyond, in the unstable region, everything is reversed. The pump becomes an engine, with heat moving upward creating KE. This of course quickly diminishes the temperature gradient. where k is the thermal conductivity (W/m/°K), and Q is the flux. This is a general Fourier law, and k need not be simply molecular conductivity. For present purposes it is augmented by turbulent transfer and also by radiative transfer if there are GHGs. I'm using "irreversible" in the thermo sense; heat flow down the gradient can be (and is) reversed by a heat pump. But that takes energy. EV = (k/T2) ∇T • ∇T, where EV is the rate of entropy increase per unit volume. The adiabatic heat pump does counter the entropy increase. But of course, globally entropy grows. The energy for the heat pump comes from air motion created by the global atmospheric heat engine, which necessarily creates at least as much entropy as the heat pump negates. And that entropy is ultimately exported from the Earth. The observed lapse rate is usually less than the DALR, and this is often attributed to moisture. There isn't actually a "moist adiabatic lapse rate" that you can cite a value for. But one way of seeing how moisture could matter is if you think of the role of specific heat. This is just the amount of heat needed to change the temperature, and during condensation, you can say that the specific heat experiences a spike - effectively a delta function with area LH. When the SH rises, g/cp diminishes. But the moist adiabat does require that condensation is actually happening, and of course in the air that happens only in some places at some times. But another reason for the lapse rate falling short of the DALR is simply that the heat pump is inadequate. It's effectiveness tapers to zero as the lapse rate approaches the DALR. But in fact the rate of entropy creation that it has to counter is quite high when GHG are present, because of radiative transfer (Rosseland conduction). And as above, to the extent that it is inadequate, the temp gradient tends toward isothermal. 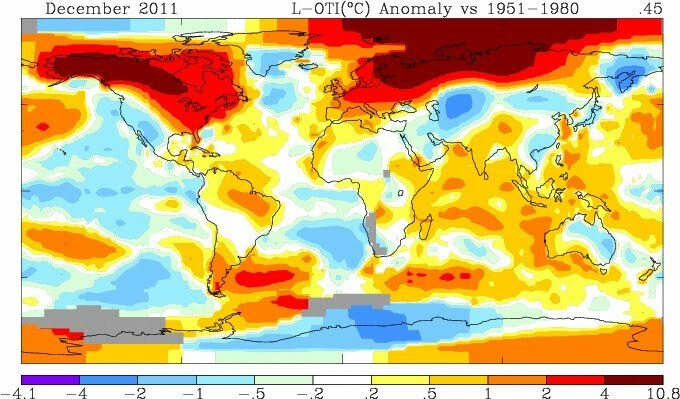 A very small rise in global mean anomaly this month, from 0.358 °C to 0.364 °C. Below is the spherical harmonic regional distribution. 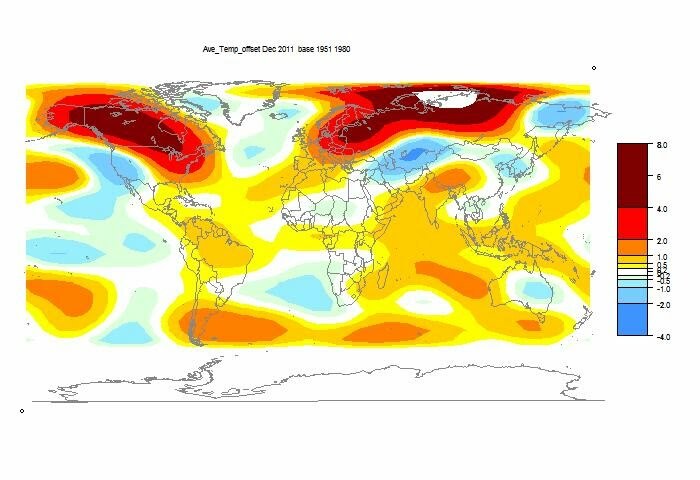 Some very high anomalies in Siberia and NW Canada.